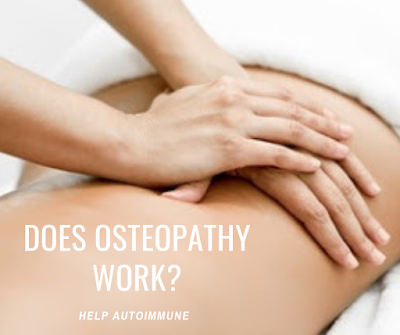 help autoimmune: Does osteopathy work? Every year, Australian osteopaths provide around 3.9 million clinical consultations. Osteopathy is a manual therapy developed by US physician Andrew Still in the mid-1800s, and it’s recognised by the World Health Organisation as a traditional system of medicine. Osteopaths rely on manual contact with patients for both diagnosis and treatment and employ a wide variety of therapeutic manual techniques within their clinical practice. Pockets of research examining osteopathic care have been conducted over the last 20 years, but there are still more questions than answers about its safety and effectiveness. I recently led a study into the existing research examining care delivered by an osteopath compared with other treatment options. The research suggested variable benefits to people receiving osteopathic treatment, depending on the condition being examined. The first study compared osteopathy’s effect on low back pain with the regular medical approach to back pain. For this study, the regular medical approach included analgesic or anti-inflammatory medication, active physical therapy, hot or cold packs and structural support. While osteopathy was not linked with any difference in participants’ perceived pain levels, the researchers found the group receiving osteopathy used less medication and required less physical therapy. In another study a few years later, people experiencing back pain reported an improvement in their symptoms when compared to people receiving no treatment, but not really any benefit compared to individuals receiving sham osteopathy. A third study on back pain compared osteopathy to physiotherapy (either as physiotherapist-led group exercise or one-on-one physiotherapy) and found similar outcomes in all three groups. The sum of these studies suggests osteopathy is just as effective (or ineffective) as standard medical care or physiotherapy in treating chronic back pain, but may be able to reduce use of pain medication. Our review also found a number of studies which examined how the cost of osteopathic care compared to other treatment options. Most interesting of these was an Italian study which found osteopathic treatment of premature infants in neonatal intensive care units (NICU) were able to gain weight more quickly and be discharged from hospital on average six days earlier than the infants in the control group.